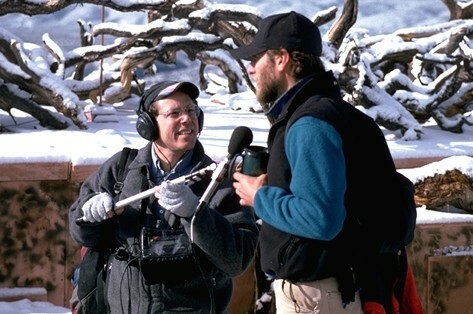 Correspondent Howard Berkes joined the NPR staff in 1981. He has covered space shuttle disasters, mine safety violations, the Unabomber and neo-Nazi groups, the rural American West, and many Olympics, just to name a few of his many subjects. His reporting has taken him all over the world. Tap local knowledge. Consult local public media reporters, local newspaper reporters/editors, local historian/”sage.” Be gracious and grateful. Be collegial. Identify “guides.” In sensitive settings (Indian Reservations, Appalachian hollows, tight-knit neighborhoods/communities, threatening situations) where outsiders and “parachuting” reporters may be suspect or unwelcome, seek out a local “guide” – a local reporter, community leader, minister. Know the geography. Review maps. Get local travel advice. Get directions and write them down. Check cell phone signal coverage for your carrier and do not rely solely on GPS, especially in rural and remote areas. Know your recording and reporting gear. Carry duplicates – backup recorder, backup microphone, duplicate cables, multiple flash cards/recording media. Carry a variety of audio adapters/cords (RCA, XLR, Mini). Test/fix your gear before departure. Load up with fresh batteries. Take all power cables. Use backup media – jump drives, portable hard drives, CD’s. Determine filing options. If you need to file stories from the road, plan ahead! Where will you have wired (preferred) or wireless internet access? How good is the bandwidth? Be sure that hotel Internet access is available and working. Beware of hotels that block VPN. Scope out wireless options (Starbucks, McDonald’s, etc.). Is ISDN available locally? Also, consider ways you could create your own wireless hot spot using your mobile phone or a USB WiFi device that plugs into your computer. Know to how edit, produce and file remotely. Practice before leaving. Know your laptop, editing software and filing options (FTP, ISDN, iPhone) and how to connect to your newsroom. Review data and documents. Find studies, reports, court records, depositions, public records, and past news stories so you’re informed. Check your sources for criminal records. Ask to see medical records when relevant. Assume nothing will work as expected. Think about overcoming obstacles. Adapt and innovate. Tap your local contacts and guides for help. Know who to reach at the home office for help – and how to reach them at all hours. Don’t be afraid to get people out of bed. Wear headphones. Ears are not substitutes for headphones. Ears don’t hear what microphones record. Recording sound without headphones is like randomly pointing a camera without knowing what the lens sees. Good sound depends on proximity and perspective. People pop p’s and spray sibilant s’s. Mic cords short-out. Ambient sounds may be intrusive. Wind thunders across microphones. None of that is heard without headphones. Never yield the mic. Whoever has the mic controls the interview and recording. Never give it up. Do not let interviewees hold the mic, and do not use mic stands for interviews (outside studios or carefully controlled situations). Mic stands don’t move when subjects sit back, turn away, lean forward or storm out. Mic your questions. Sometimes, the answer depends on the question and the interchange is dramatic. Wind. Carry a wind-resistant mic (RE-50) and wind screens, but even they won’t work in heavy wind. Use wind breaks – your own body, walls, cars, crevices, tree trunks, boulders. Weather. Plan for rain, snow, extreme cold and extreme heat. Know how to protect your gear. Digital recorders may be especially sensitive to high humidity, high heat and below-freezing cold. Take good foul weather gear, for yourself and your equipment. Lousy mult boxes. Even expensive events (campaign stops, Olympic news conferences, election nights) can have poor mults with unacceptable noise, distortion or low levels. Plug in early and insist on sound checks. Complain about poor sound. Be prepared to setup your own mic (with mic stand, long cable) properly placed and insist on doing that if sound remains poor. Noisy settings. Take control. Sometimes, natural ambient sound is appropriate for interviews, but be aware of the editing challenge presented by a noisy environment with changing ambience. If you stay in the noisy setting, be sure to record at least 2 minutes of the ambient environment with the same mic placement used for the interview. Seek quieter settings – inside a car, a quiet room, a greater distance from the noise. Don’t be afraid to turn off refrigerators, incandescent lights, air conditioners and furnaces – but remember to turn them on again. Explain why that’s necessary: to get the full quality of the subject’s voice without distracting sound. 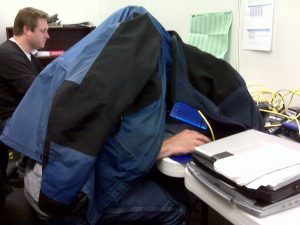 Howard Berkes creates a makeshift “recording booth” with his parka at the 2010 Olympics in Vancouver. Editor Quinn O’Toole sits in the background. Hotel rooms. Be aware of traffic, A/C-heater hum and echoes. If narrating, build a makeshift studio by shrouding you and your recorder in blankets (or a coat — see photo at right). Defeat the solid surfaces of the room. Multiple subjects. Arrange them so they are easy to mic. Ask them to pause before speaking, and perhaps signal, so you can get the mic to them. Recording on the go. Recording while driving, running, walking, skiing, boating, rafting, diving, flying, swimming, riding horses, riding a luge sled, etc. require special attention to mic placement and the logistics of carrying mic/recorder. Innovate and experiment ahead of time. Be aware of mic noise (still wear those headphones). Think gaffer’s tape and waterproof and weatherproof accessories. Tap built-in sound systems. Consult colleagues. It’s all been done before, so there are ways to do it. Peruse the perimeter. At every recording location — whether a news conference, event or interview — look around. What’s on the fringes? Are there people watching, reacting, emoting? Are there “artifacts” of an interview subject’s life that may be worth noting or discussing? Is there action you and other reporters are missing because they are too focused on the podium? Treat people with respect. People are more than props for your storytelling. Invest time and sincere interest in them, and they will open up. Back-time your deadlines. Know your deadline and calculate from that moment back: How long do I have to file? How long do I have to write, edit and produce? How long do I have to gather audio and information? Let the story evolve. Start with a focus but be prepared for the story to change as you experience it on the ground. Embrace the unexpected. Capture the surprise. Ask sources for more sources. Follow new threads. Show up. Nothing informs more than actually showing up. More sources and perspectives appear. Documents are within reach. You gain respect and trust for being there and seeing/hearing what it’s really like. Talking face-to-face provides a human connection not possible over the phone or via Skype or email. When you’re trusted more, people reveal more. Every story, event and issue has nuances discernible only by showing up. Find archive audio. Is there archived or official audio/video that helps illustrate past action relevant to the story/event? Ask police/sheriff/emergency operations centers for 911/emergency radio audio. Check museums/libraries/government agencies for historic audio/video. Find out what local TV/radio broadcasters and reporters have saved. But be careful about rights! Who owns the material and what will it take to get clearance? Stay fed and hydrated. Get enough sleep (if at all possible). Sit down to eat lunch or dinner. Carry snacks and water with you. Keep in touch with office/editors and home.